It is common knowledge that the roads in the Benicia Industrial Park are in need of repair. 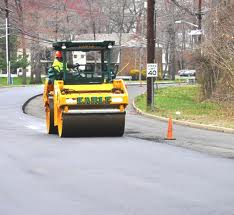 According to a study updating the Pavement Management Program of the city done in January of 2011, the replacement cost of the City's pavement is estimated at $109 million dollars. As this is not in the City's budget, creativity and out-of-the-box thinking has been used to try to use resources as wisely as possible to keep roads in the city in the best possible shape possible. One of the ways that the City hopes to repair the roads in the Industrial park without a budget for it, is to try to improve the roads and transportation in concert with other improvements. The proposed Benicia Industrial Bus Hub Project is an example of this. The general plan here is to use County and State funding to add a Bus Hub at the corner of Park and Industrial in the Park. The surrounding roads would also be approved as part of this project. You can follow this link to find more information as is published by the City of Benicia. On October 16, 2013 - the Notice of Intent to Adopt a Mitigated Negative Declaration was sent out with regard to this project. On January 21, 2014 - the plan was approved by the Benicia City Council. The project was handed over to the Solano Transit Authority. In association with this, the city will be creating a Food Vendor Ordinance. More information can be found here.